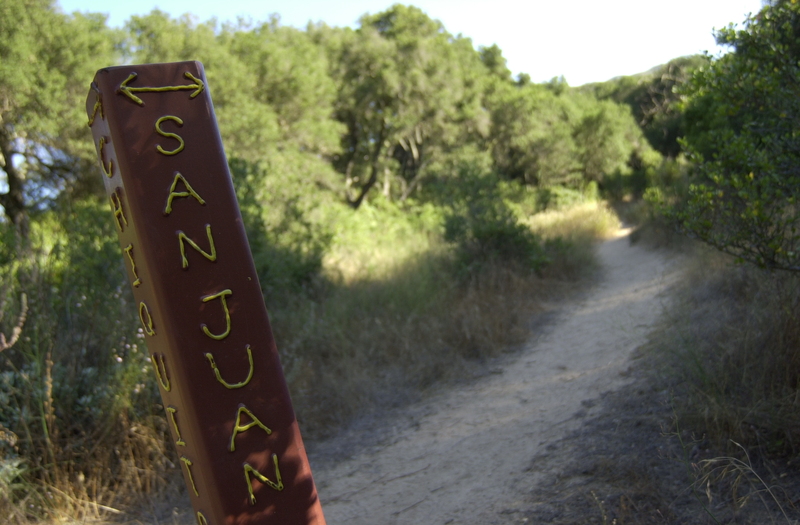 | "Journey to the Trailhead"
Rolling hills and a bubbling creek make a great way to spend a hike on the San Juan Loop Trail, one of several trails in the Cleveland National Forest near Lake Elsinore. Steep cliffs, along with lizards that shoot across your path, may cause you to focus on your footing, rather than the view of distant hills or the colorful flowers and native plants that surround the trail. On a recent outing, I took a left at the first fork in the San Juan Loop Trail and headed into the valley toward the sound of the creek. Mosquito net, bug repellent and water are suggested carry along items. Judy Behrens, a Cleveland National Forest public services manager, recommends hikers tuck their pants into their boots and check for ticks. Other dangers in the park are common sense things. She says hikers should watch for rattlesnakes [ I didn’t see one ] and always carry ample water. Behrens wouldn’t drink the water on this trail even if she treated it, she adds. There’s plenty of sun on the way down while taking in views of distant hills, tall cacti and aloe plants. After a few switchbacks, I was ready for the cooler shade and the sound of the creek down in the valley. Through the deep wooded area at the bottom my bug repellent came in handy. 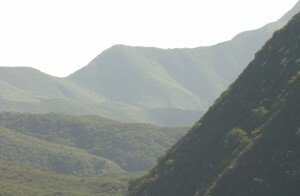 The San Juan Canyon Creek is visible from the trail as you curve closer to the highway. Soon you will see a trail marker at the intersection of the Chiquito Trail. Stay on the San Juan Loop Trail unless you want to lengthen your day by at least nine miles. Upon entering the camping and picnic area I became a little confused by the path that kept splitting in various locations with little signage. But after veering left, I was back on track. Soon, I was climbing the hill and back in the sunshine. Looking over my shoulder I noticed the pristine green hills dotted with white boulders. After making my way up the hill, the trail widened. At last I saw the roof-tops of the parking lot bathrooms and knew I had completed my journey. I was ready for an ice cold Gatorade at the Candy Store located just across the street. While you are there, remember to update your adventure pass [$30 per year] necessary for parking. Behrens says, “The San Juan Loop is good for families. It’s about two and a half miles long but seems longer because of multiple switchbacks. To get there, you exit the I-15 at Highway 74 or Ortega Highway at Lake Elsinore. Follow the curvy highway up the mountain past Lookout Restaurant – a popular biker hangout. Continue five or six miles down the other side of the hill and the San Juan Loop trailhead parking area will be on the right. This is across the highway from the Candy Store. You should be careful pulling out of the parking lot as oncoming traffic is not easily visible. George Draper, says after finishing the trail he feels very invigorated. I come out here twice a month.